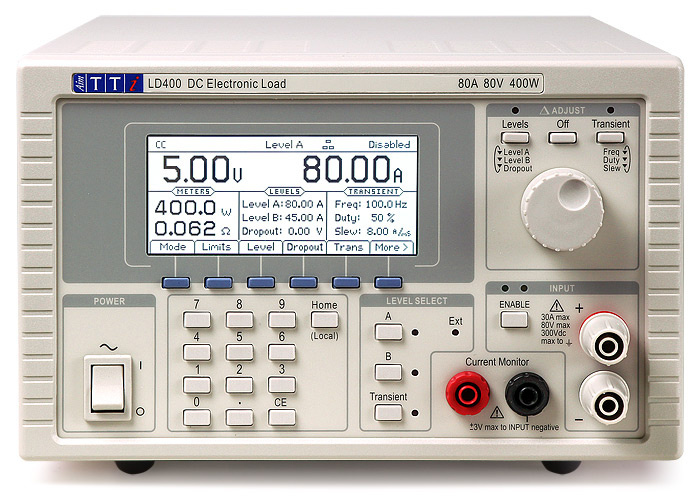 The LD400 is an inexpensive electronic load which is suitable for testing and characterising a wide variety of dc power sources. It can be used to investigate the behaviour of many different types of power source such as batteries and solar cells, as well as electronic power supply units. Its wide voltage/current range, multiple operating modes and builtin transient generator give it the versatility to offer test solutions from the design laboratory through to the component test area. The LD400P adds full bus remote control via USB, RS-232, GPIB and LAN (Ethernet) interfaces.. The LD400 can operate at voltages below 500mV for currents up to 10 amps. At higher currents the fixed minimum resistance (typically better than 25mW) gradually raises the minimum operating voltage, but it remains below 1 volt up to 40 amps and below 2 volts up to 80 amps. This low operating voltage allows it to be used for many low voltage applications for which other electronic loads are unsuitable. The LD400 incorporates a full variable frequency, variable duty cycle transient generator. Switching between the two preset levels can be done at any frequency between 0.01Hz and 10kHz. The transient generator can be used in all operating modes. The rate of change between levels (slew rate) is controllable over a wide range.